What Happens When an Animal Causes a Car Accident? You are here: Home / Car Accident / What Happens When an Animal Causes a Car Accident? Car accidents involving animals are unfornately not uncommon. One of the more complicated car accidents cases is those involving animals. Whether that is a pet or one from the wild, this factor can take a relatively simple case and make it complex. Here are some of the basics surrounding this strange type of car accident. There are two fundamental ways in which animals cause collisions. Wild Animal – The first is a wild animal running onto the road. It could be as small as a squirrel or as large as a dear, but no matter what, it plays a role in your crash. That might mean colliding with the animal, or swerving to avoid it and hitting something else. Either way, it has a significant role in your crash. Pet in Car – Many people love driving with their pets. Unfortunately, misbehaving animals can distract drivers, especially when making physical contact with them. The most common culprit in these situations is dogs, but any domesticated animal can play a role. Not every collision happens between two vehicles. Instead, many of them involve only one car. Such is the case in many animal-caused accidents. 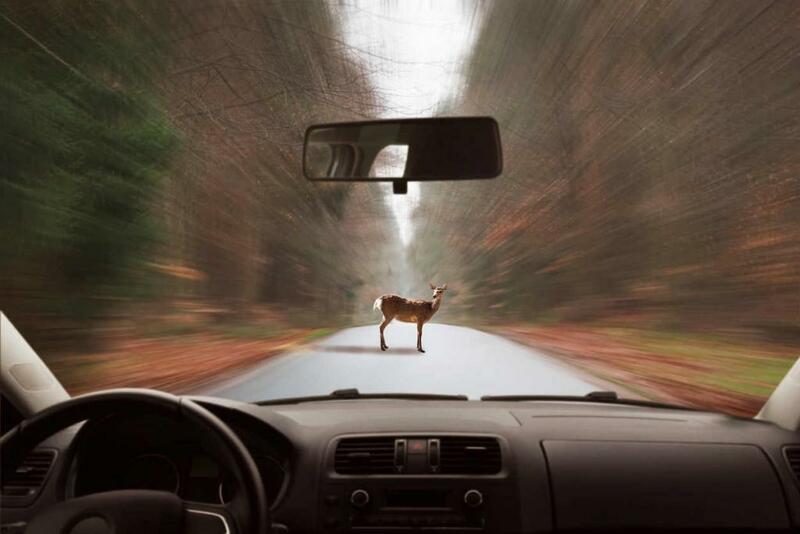 Two typical examples are hitting the animal or swerving away from it and hitting an object on the side of the road. Unfortunately, you won’t have a personal injury case in these situations, as no person is to blame. Instead, you’ll generally have to work with your insurance company exclusively. The other possible outcome is an animal causing a car to hit another vehicle. Before we discuss the repercussions of doing so, let’s review how personal injury lawsuits work. Essentially, a determination is made regarding who was at fault for the accident. This may mean one driver being deemed 100% at-fault or liabilty may be distributed between the two drivers. This activity informs all parties involved of how they should handle their case. Now, onto animal-caused collisions. The first way they occur is when someone swerves away from an animal on the street and hits another car. The second is a misbehaving pet distracting a driver and making them hit someone else. The latter case will almost undoubtedly lead to liability for the person with the pet. The former situation is a bit more complicated, but in general, the driver who swerves takes on at least some of the blame. No matter what the conditions surrounding your accident are, you can always report the incident to your insurance provider and see if they will cover the damages. That will be your primary option in a single vehicle crash. When multiple cars are involved, you may have a legitimate personal injury claim against another driver. In that case, it’s a good idea to speak with a St. Louis auto accident attorney as soon as possible. Give us a call 24/7 at (314) 361-4242 for a FREE case evaluation.